Rejoice in the word of God through song and worship music! As a big part of our Sunday sermons, our church choir performs uplifting and spiritual music for the congregation to enjoy. The Springboro United Church of Christ welcomes all who enjoy sharing their musical talents, whether it be singing or playing an instrument. 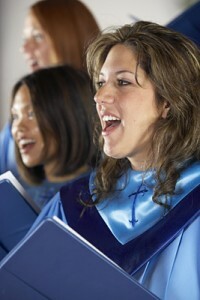 The church choir meets once per week to practice, on Wednesday evenings at 7:00 p.m. If you have an interest in sharing your musical abilities, please contact us at (937) 748-1969, or send us an e-mail. We always have room for anyone who loves the fellowship of music.